We believe students are capable of doing powerful mathematics. 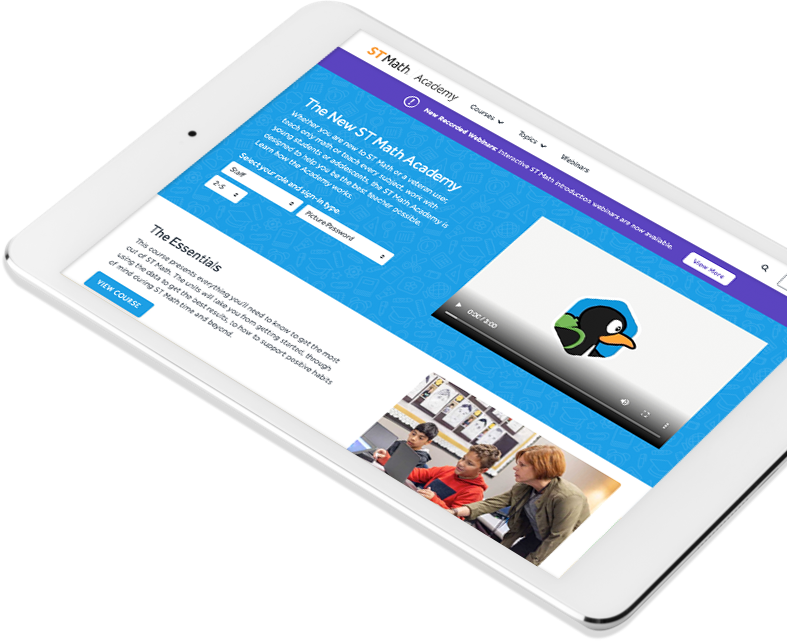 We empower teachers to build a greater understanding of how students learn, develop their math content knowledge, employ strategies that impact student learning, and effectively use ST Math through online and in-person training and support. Online, interactive trainings with a live trainer. Online modules where participants can work at their own pace and engage in interactive activities to further their learning. Engage with a dynamic trainer to provide personalized attention and customization to meet the needs of your educators. Includes in-person trainings and/or exclusive webinars. ST Math program training is designed to introduce educators to the ST Math software and the neuroscience behind it. Understanding “why” ST Math works, how schemas are constructed, and the focus of the teacher as a facilitator helps educators utilize the program as an instructional tool. Additional coaching and consulting services are also available to support program implementation. ST Math is more than just a software program. It is a dynamic tool for instruction and learning. These in-person workshops help teachers get the most out of ST Math as students play individually, and teachers integrate puzzles in the classroom and use reports to guide instruction. These in-person workshops deepen participants’ content knowledge while developing instructional practices to move math instruction from practicing procedures to solving and making sense of problems. These in person workshops help participants learn how to shift classroom culture from a procedural, teacher-centered classroom to one that is student-centered. Teachers are provided with hands-on problem-solving lessons that engage learners, resulting in a more productive, creative learning environment. Twana Young is a former classroom teacher, district curriculum specialist, and district curriculum director for Math, Science and Instructional Technology with over 20 years of experience in education. She’s led school improvement efforts; developed and implemented curriculum, assessments, coaching programs, STEM learning pathways and professional development trainings for teachers. Marti Klingshirn taught elementary students in a large urban school district. She achieved National Board Certification as a Middle Childhood Generalist. During her final 8 years in the district, she worked as an Elementary Math Curriculum Coordinator. Marti has conducted trainings and worked on standards and assessment projects at the local, state and national level. Marti came to work at MIND because of her commitment to math education and her belief that ST Math could make a significant difference for students. Vivian Cullen is an accomplished educational leader with an infectious enthusiasm for the future of mathematics instruction. Vivian possesses degrees in both business and education and has over 20 years of experience in the field of education. Vivian is a former teacher, principal, district program director, district mathematics instructional coach, and national mathematics consultant. Her mission is to foster a powerful ‘we can’ attitude for teaching and learning mathematics by designing and delivering innovative instructional content that promotes a new generation of students who love math and are capable of solving the world’s most challenging problems. Carl Robison is a former teacher with a BA degree in Elementary Education from University of Central Florida. He spent 13 years teaching elementary and middle school math and 10 years as a GED adult educator. Carl also spent 5 years as the owner and operator of FCAT Blast, an edutainment company aimed at increasing scores on the Florida state exam. He also spent 5 years as an education consultant/on-air host at Educational Management Group. He has been with MIND Research Institute for 8 years as an education consultant and a curriculum developer. Lynn Nordstrom, PhD, has been a curriculum developer at MIND for over 4 years. Before receiving a doctorate in Instructional Design for Online Learning, she taught PK through 8th grade and graduate courses in math for teachers. She was the Principal Investigator on several large math and science grants. Lynn lives over a mile high in Albuquerque, New Mexico, where she does, in fact, put green chile on everything. Will Miller has been a distance learning developer at MIND for the past 4 years and has 11 years experience in education. While earning his MS in Education he worked as a curriculum designer and adult instructor of ESL. After graduating, Will served for 3 years as an Instructional Designer building online learning, in-person training, and certificate program materials for educational technology companies. For the past 6 years, he has been a distance learning web developer building HTML5 course and manual frameworks, various web applications, and a central learning hub for adult learners. "I love the brain research and engagement strategies embedded into the training. It gave me great ideas to take back to my classroom and start using immediately." "The training was very engaging. Great job! I felt like you reaffirmed much of what I already believed about math learning for students, plus showed me some practical ways to tap into that and leverage it with students." "The 'train the trainer' ST Math PD was hands-on, extensive, and meaningful! They tailored it to meet our district’s needs, gave us plenty of time to work, plan and process. Such a transformational PD series!" "I walked into the first training day with a negative view of ST Math. It was based on observations I had made 4-5 years ago on my campus. Boy, was I mistaken. After the first 15-20 minutes of training, after learning the REAL purpose and mission of ST Math, I realized that the makers were actually geniuses! I now understand and respect the spatial temporal process as well as the perception action cycle which it takes to learn!" Let's talk about how Professional Development can help your team!